Drain cooked pasta in a colander over the sink. Don't rinse it - the precious sauce-catching starch will disappear down the sink. A few tablespoons of the cooking water can be used to thin a too-thick sauce. Cook onion and garlic together in 3 tbsp of the olive oil until soft and limp but not coloured (about 10 minutes). Set aside in the pan until needed. Fry pine nuts in remaining olive oil, stirring, until golden. Drain and reserve. Bring 5 litres of well-salted water to the boil. Cook broccoli florets for 5 minutes (the broccoli should not be crunchy). Drain well, reserving the cooking water, but do not refresh. 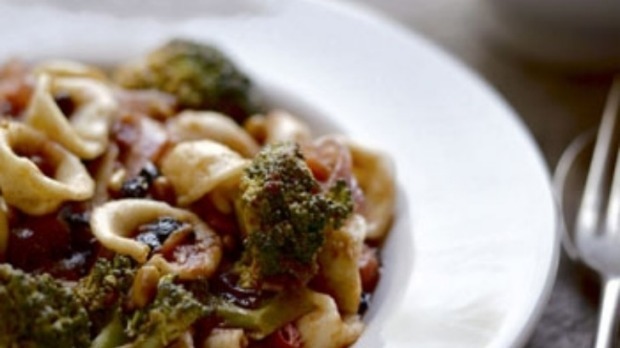 Set aside.Cook orecchiette in the broccoli water for 10-15 minutes until cooked (this pasta will always remain a little firm in the centre). Drain. Return onions to the heat, add anchovies, currants and any red wine vinegar remaining in the dish and the tomato sauce. Stir to bring to simmering point. Add broccoli. Once hot, add the pasta and the pine nuts, toss to mix and tip into warmed serving bowl. Offer grated or shaved parmigiano-reggiano separately.